Hi, I’m Mique from 30days. I live in the (mostly) sunny Los Angeles area with my husband and three cute kids. In addition to being a wife, momma and craft blogger, I co-own a handmade market, the Queen Bee Market in the San Diego area. Our next show is May 6-7th- come visit! 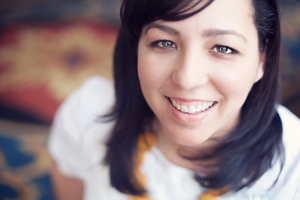 I adore Cindy and was thrilled when she asked me to guest post. 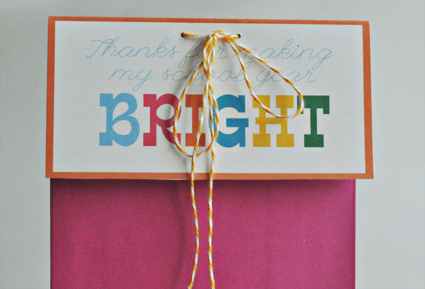 Thanks for letting me share my little teacher gift topper here Cindy! I found the saying for this idea from Cindy’s teacher appreciation sayings post. 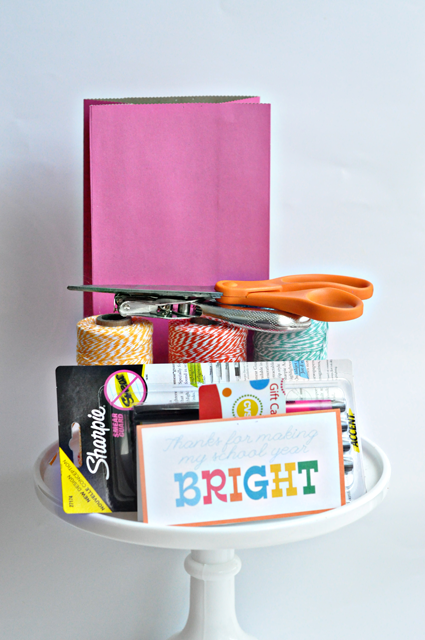 Ready for the easiest teacher gift? Pick up your favorite pack of highlighters and a gift card to a teacher supply store (or anywhere you want). 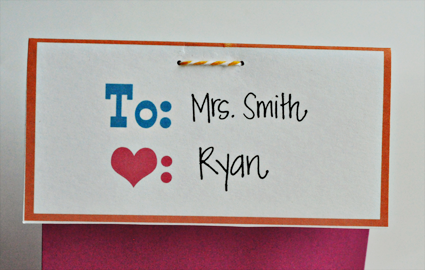 Print out the teacher gift topper. Have your child fill out the back. Adhere topper to the gift bag. And dooooone! Very fun and creative site. I'm sure I'll be visiting a lot more! Hey thanks! Really great article, really enjoyed it! I love when great ideas are made fun and easy. Thank you! And I'd also love to know the font for the BRIGHT! The simplest and darling ideas are always my favorite. LOVE this! Love the tag, thanks for sharing! What is the name of the BRIGHT font? I love it! 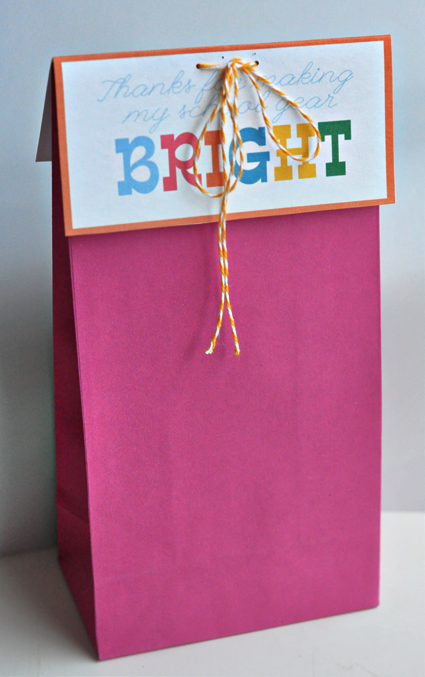 Such a bright and fun gift. And I'm loving the twine too!